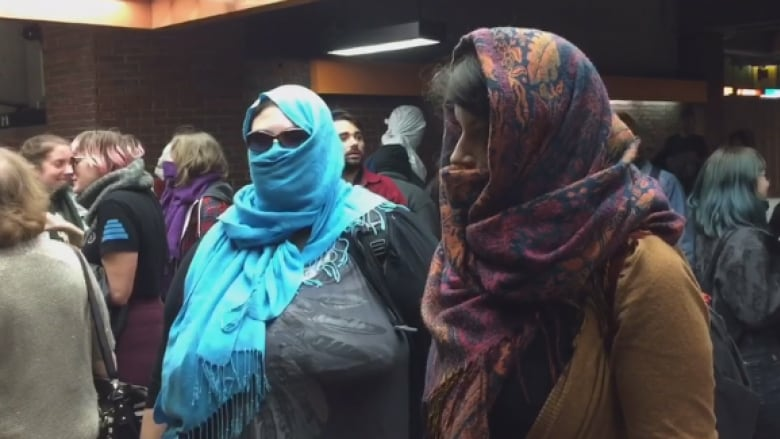 Protesters descended into Snowdon Metro station Sunday to denounce Quebec's Bill 62 which requires people to show their faces when they give or receive public services. About 70 people covered their faces before entering the station. Many people wore scarves and surgical masks but Razia Chanda was one of half a dozen women who rode the Metro wearing a niqab — even though she typically doesn't wear one. 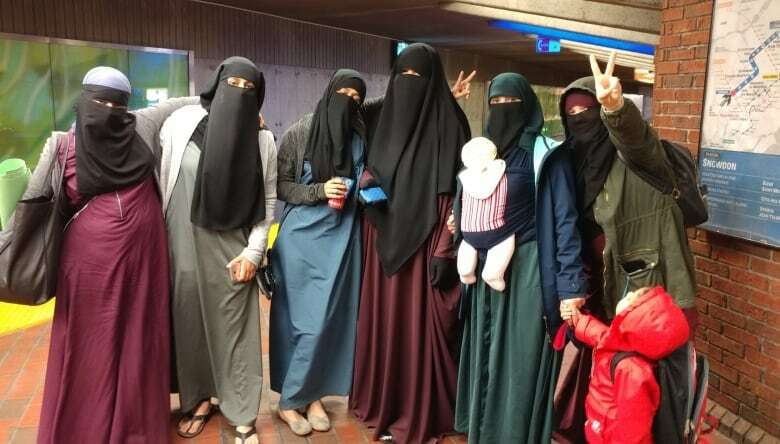 Her nieces wear the niqab and she felt it was important to show solidarity with them. "I want to make sure that they're safe and they're protected," she said. She thinks the bill is a political move that is bullying a group of less than 100 people in Quebec who cover their faces. "This handful of women just want to go about their daily lives in a peaceful way, observing their faith," said Chanda. The STM told CBC it would not comment on the protest. The protest was organized on Facebook and appeared to be hosted by Québec Solidaire. However, Québec Solidaire said it was not involved in the event and that it was a grassroots effort by certain individuals. Similar protests took place earlier in the week where people lined up at bus stops with their faces covered. Public transit agencies in Montreal and Laval say they haven't received directives on how to implement the law, leaving them worried that bus drivers will have to make an individual judgment call. The new law applies to many public institutions, including public transit authorities. It was passed Wednesday at the National Assembly in Quebec City. All Quebec ministries will be subject to the law, as will all school boards, universities, public health-care institutions, subsidized daycare centres, municipalities, public transit authorities, and the Montreal region's train agency, the RMT. Several municipalities, including Montreal and Quebec City, have already come out as adamantly opposed to the law.